Some countries go cuckoo for Christmas. Lights adorning every tree-lined street, robotic Santa’s and snowmen in all department store windows and a magnificent Christmas tree standing proudly in the city centre – especially shipped in from some far-away forest, to tower above last year’s effort. From the gaudy to the beautiful, here are some of our favourite lighting displays from around the world. 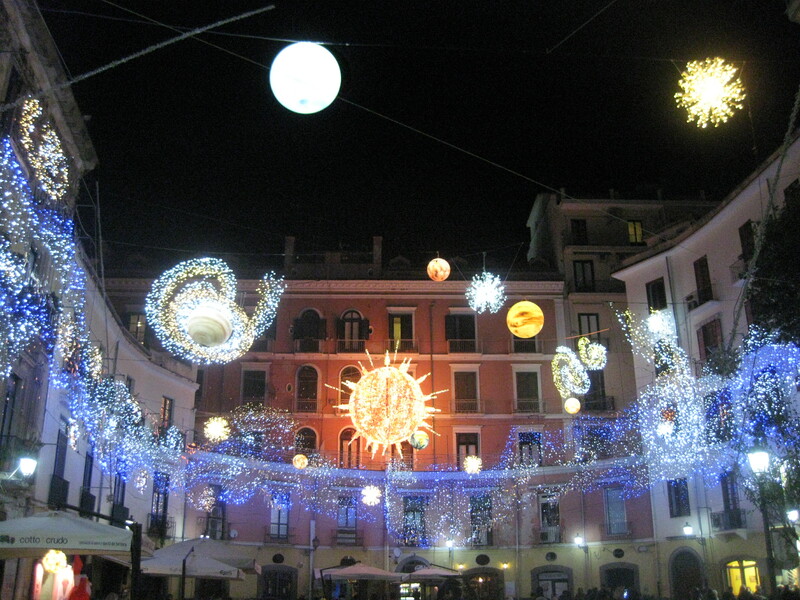 In the Italian city of Salerno they take their Christmas lights very seriously indeed. They have a tradition known as the Luci d’Artista (Artist Lights) and it sees a different artist design the light installations around the city each year. This year the theme is the Northern Lights and Fairy Tales and glimpses of their alternative take on Christmas lights can be seen all around, from the main square to side streets. In the most famous city in the world thousands gather at the Rockefeller Centre for the annual lighting of the Christmas Tree. But travel across the bridge into Brooklyn and you will be in for a treat. Residents in the now famous Dyker heights are giving the Rockefeller display a run for its money by spending thousands lighting up their houses all in the name of Christmas. Warning: sunglasses may be needed. The historic Grand Place is lit up in the theme of Winter Wonderland this year as tourists flock to see the beautiful Christmas markets, the ice rink and local artisan foods and products. This year they are showcasing one of the biggest Christmas trees they have ever had, a 22 metre gift from the City of Riga. Christmas is near perfect at the Liseberg Amusement Park in Sweden. With icy conditions guaranteeing a snowy covering, the addition of thousands of glittering lights to the trees and 20th Century houses make this idyllic setting almost too much to bear. Almost. This sprawling City has much to offer in the way of Christmas lights from the classic display on Regent st to the playful winter decorations at Covent Garden but we rather like these unorthodox white orbs dotted along Oxford Street. This Christmas Light display in Australia’s capital of Canberra has been confirmed by the Guinness Book of records as the largest ever LED image display. Lawyer and Christmas light enthusiast David Richards led the project after winning the title last year for the most lights on a residential property. This time he has shifted his efforts from the suburbs to the CBD where almost 1.2 million lights shine bright on his display. Tokyo showcases many impressive displays such as the tree-lined street of Naka-Dori with ‘champagne-gold’ lights on each and every tree. Perhaps the most spectacular however is the Starlight Garden Lights in the Midtown Garden area. A vast sea of nearly 200,000 lights create a magical experience.